A lot of people will say that they are able to balance their time wisely. Are they made of magic? How do they manage to tackle so many projects with so little time? We’re here to tell you that this unknown region of perfect balance is reachable. You just have to know how to go about your day. In a previous blog post, we talked about how to run effective meetings. Being able to manage your time outside of meetings will help you stay on track all around. We don’t know how there are people out there that don’t use to do lists. They are the strongest weapon for balancing time. Have you ever committed the mistake of telling yourself “Nah I don’t need to write it down; I’ll remember it later!” Nope. You never do. Save yourself the trouble and write it in. There are some great apps out there that send you reminders and let you write in notes so you can keep track of your progress. Never underestimate the power of a good to do list! Everyone loves to say that they are excellent at multitasking. But is that really a good thing? Most of the time, multitasking is just your brain trying to switch from task to task rapidly to get things done. But are you able to allocate the proper time to each task before you move on to the next one? We have found that blocking out time frames and creating a game plan in the morning is way easier for “multitasking”. Dedicate the first hour of your morning to answer emails from the day before. The next two hours can be spent knocking out the small stuff. 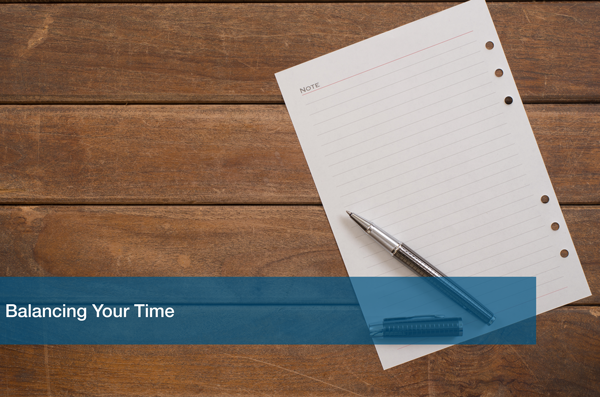 Then depending on what else you have for the day, you can create time blocks for each task to keep yourself on track. This is less tiring because you aren’t constantly switching from task to task. This one can be a bit tricky. Know how to prioritize your tasks. When we write them in to our to do list we give them a ranking value (A, B, C). A tasks have to be done today. B can be done sometime this week. C tasks are something you want to get done eventually. This will help you plan out your day. Knock out your A tasks first, then some B tasks, and so forth. We promise you your work day will breeze by because of how productive you are being. We could go on forever about how to prioritize your time wisely. But for now, we leave you with these three simple tricks. If you find technology is keeping you from being productive, schedule a free IT Analysis with one of our experts, and we’ll help you get back on track!